Laugharne, the sleepy sea town on Carmarthen Bay immortalised by its most celebrated inhabitant, Dylan Thomas, was not always the tranquil backwater it is today. Its handsome castle, standing foursquare on the waterfront overlooking the Taf estuary, bears testament to a troubled past when the Normans built a string of coastal strongholds to consolidate their hold over south-west Wales. Laugharne was probably founded in the early 12th century as an earth and timber fortification, though as it now stands the castle dates mainly from the 13th century. Laungharne's story concerns comfort as well as conflict for, unlike some of its neighbours, this fortress was later adapted to provide stylish living accommodation. 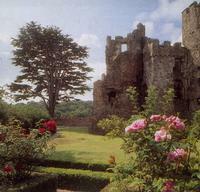 In the 13th and 14th centuries, Laugharne was the home of the de Brian family. Much of their stone castle survives, including two large towers and a gatehouse. The transformation of the castle into a fine mansion was the work of Sir John Perrot, who was granted Laugharne by Elizabeth I in 1584. The castle saw service during the Civil War, after which it declined into a romantic ruin and became the subject of a dramatic watercolour by J.M.W. Turner. Its extensive restorations include a delightful Georgian and Victorian garden. Dylan Thomas's oblique description of a castle as "brown as owls" may have been inspired by the time he spent writing in its gazebo, a garden summerhouse built over the base of a medieval tower. Richard Hughes, author of A High Wind in Jamaica, also wrote here.